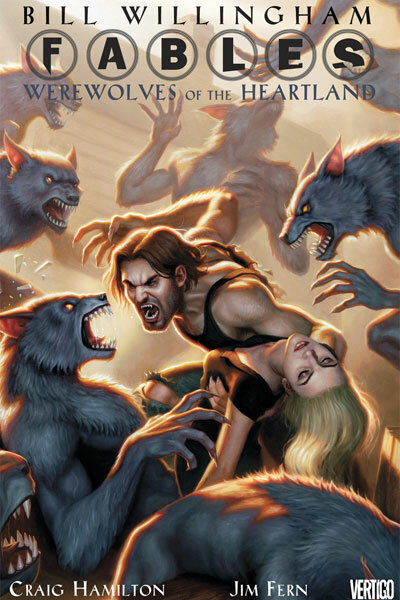 Fables: Werewolves of the Heartland, a spin-off of the hugely popular Fables comics, has been a LONG time coming. Fans of the Vertigo comic have been waiting well over a year for this graphic novel to arrive and at long last it looks like it is actually coming. Hopefully. Since the last time I wrote about the highly anticipated Werewolves of the Heartland, the release date has changed… again. According to the Vertigo website, it is now going to be released on November 14, 2012. The award-winning Fables series follows an assortment of characters from fairy tales and folklore – referring to themselves as “Fables” – who have been forced out of their Homelands by The Adversary, a powerful being who has conquered the realm. The Fables have traveled to our world and formed a secret community in New York City known as Fabletown. In Fables: Werewolves of the Heartland, Bigby Wolf takes center stage in what might be the most action-packed FABLES story to date. Bigby embarks on a quest through the American Heartland to find a new location for Fabletown. In his wanderings, Bigby stumbles across a small town named Story City, that, amazingly enough, seems to be populated by werewolves. Who are they and where did they come from? They aren’t Fables, but they sure aren’t normal mundys. They seem to already know and revere Bigby, but at the same time they’ve captured and caged him – but why? Unravelling the many mysteries of Story City may cost Bigby more than his life. This hardcover graphic novel will be in color and is 144 paged long. Hopefully it is worth the ridiculously long wait. Vertigo definitely knows how to tease their fans. Any Fables fans here? How do you feel about the date being pushed back for the hundredth time? Will you pick up a copy of the graphic novel once it’s out? Awesome Cast For The Mortal Instruments Adaptation Unveiled!